I recently purchased a pair of MDS 9216i switches for my CCIE Data Center studies, as they will suit me for the majority of my storage studies (minus FCoE). 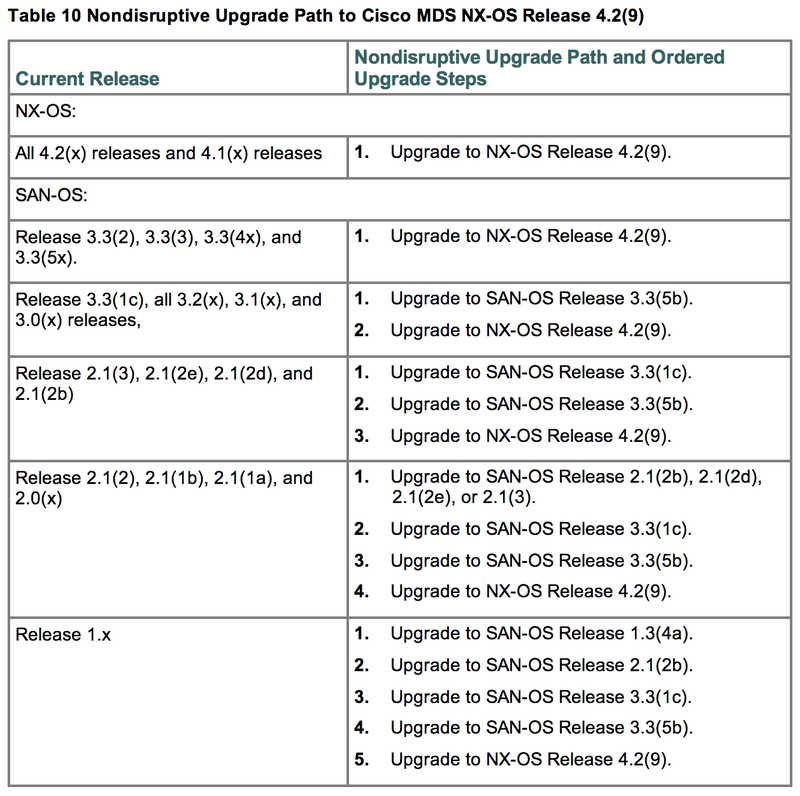 The MDS’s shipped with old code, SAN-OS 3.0, and I needed them upgraded to at least NX-OS per the blueprint. For a lab with disruptive capabilities, this is super easy to do. Intel(R) Pentium(R) III CPU with 963836 kB of memory. Verifying image bootflash:/m9200-ek9-kickstart-mz.3.3.5b.bin for boot variable "kickstart". Verifying image bootflash:/m9200-ek9-mz.3.3.5b.bin for boot variable "system". Extracting "system" version from image bootflash:/m9200-ek9-mz.3.3.5b.bin. Extracting "kickstart" version from image bootflash:/m9200-ek9-kickstart-mz.3.3.5b.bin. Extracting "bios" version from image bootflash:/m9200-ek9-mz.3.3.5b.bin. Extracting "loader" version from image bootflash:/m9200-ek9-kickstart-mz.3.3.5b.bin. Rebooting the switch to finish the upgrade. Intel(R) Pentium(R) III CPU with 963828 kB of memory. Now perform the same procedure again for the NX-OS upgrade. Verifying image bootflash:/m9200-ek9-kickstart-mz.4.2.9.bin for boot variable "kickstart". Verifying image bootflash:/m9200-ek9-mz.4.2.9.bin for boot variable "system". Extracting "system" version from image bootflash:/m9200-ek9-mz.4.2.9.bin. Extracting "kickstart" version from image bootflash:/m9200-ek9-kickstart-mz.4.2.9.bin. Extracting "bios" version from image bootflash:/m9200-ek9-mz.4.2.9.bin. Extracting "loader" version from image bootflash:/m9200-ek9-kickstart-mz.4.2.9.bin. Performing Compact Flash and TCAM sanity test. Intel(R) Pentium(R) III CPU  with 965648 kB of memory. Oh this was F’ing GREAT!!!! We followed this now up and running on nx-os, bought an mds 9216i for 150 BUCKS!